A true colloidal silver mineral supplement with the highest particle surface area for maximum effectiveness. MesoSilver is an all natural mineral supplement in the form of nanoparticle colloidal silver. It is a true colloidal silver, which means the majority of MesoSilver consists of silver particles, not silver ions. Learn more. In fact, it has the highest nanoparticle concentration: 80% particles (typical). Others are only 10%. For more information read When is Colloidal Silver Not A Colloid? Read What is Ionic Silver? to learn what other producers don't want you know. MesoSilver tastes like water to most people - though a slight metallic taste is normal for some. See FAQ page for more details on taste. 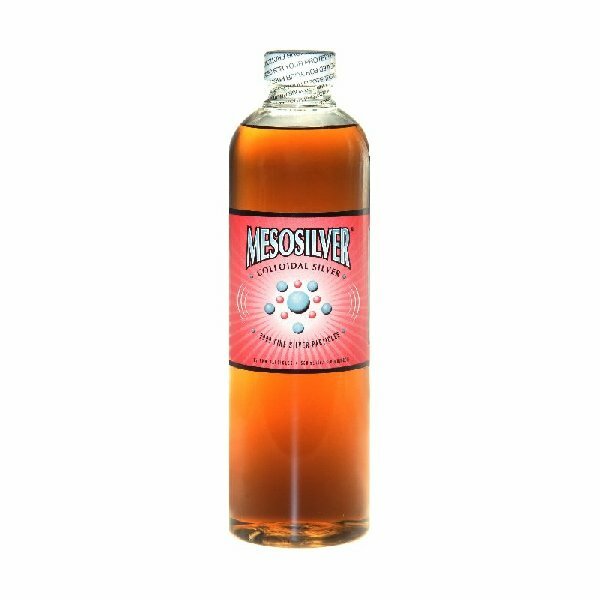 MesoSilver combines small particle size and high particle concentration, a powerful combination of properties, to produce a colloidal silver product that has the highest particle surface area of any colloidal silver product ever tested. The Comparison Table shows how the particle surface area of Mesosilver compares to other products. To understand why the surface area of silver particles is the key to colloidal effectiveness read Colloidal Silver Effectiveness. Mesosilver is manufactured in an FDA registered facility, has no potentially dangerous protein additives (mild protein), and is non-toxic. See Material Safety Data Sheet (MSDS). Will not cause argyria, a discoloration of the skin caused by some forms of silver (protein products). 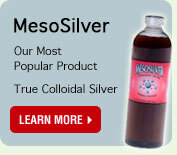 Mesosilver brand colloidal silver is the result of thousands of hours of research and development conducted at the Colloidal Science Laboratory, Inc. (CSL) over a period of several years. Purest Colloids, Inc. is the exclusive worldwide producer of MesoSilver. The resulting product, with a particle surface area many times greater than other products of this type, provides more usable silver to the body. To better understand how to compare colloidal silver products, see How To Compare Colloidal Silver Products here. Learn about the relative size of the colloidal silver nanoparticles in Mesosilver with our Meso-World Visualization Tool. Three types of products all claiming to be colloidal silver. High particle surface area makes Mesosilver brand colloidal silver more effective than silver protein type products with silver concentrations in the tens of thousands of ppm.